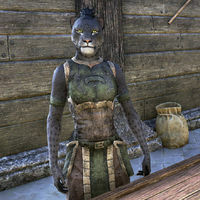 Fishmonger Kazra is a Khajiit grocer who can be found at her shop, Culinary Imports, on the harbor terrace in Skywatch. When you speak to her, she says, "This one was told Perch are running today. Best get out there while you can." Kazra is one of the grocers who can teach you the basics of provisioning. This page was last modified on 7 January 2018, at 19:48.